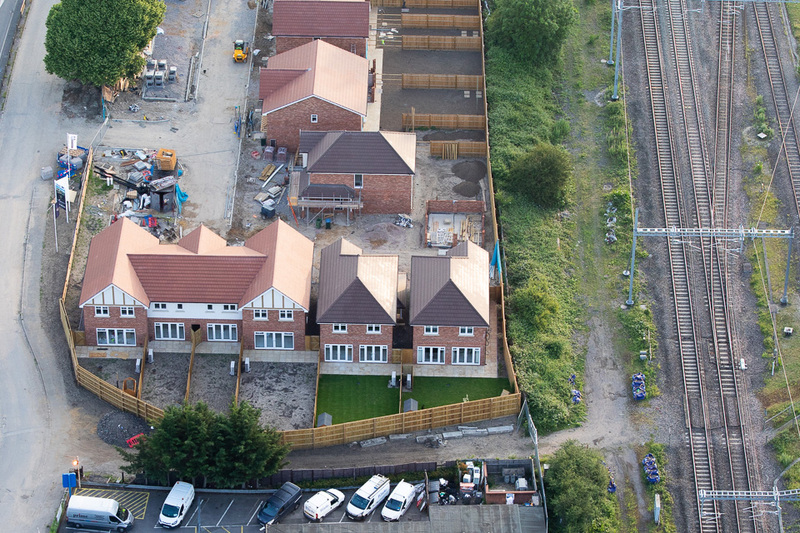 Every time a new housing estate gets built, a lot of work is done both inside and outside of HM Land Registry (HMLR) to make sure the land registration process goes smoothly. But how can we make these registrations easier? 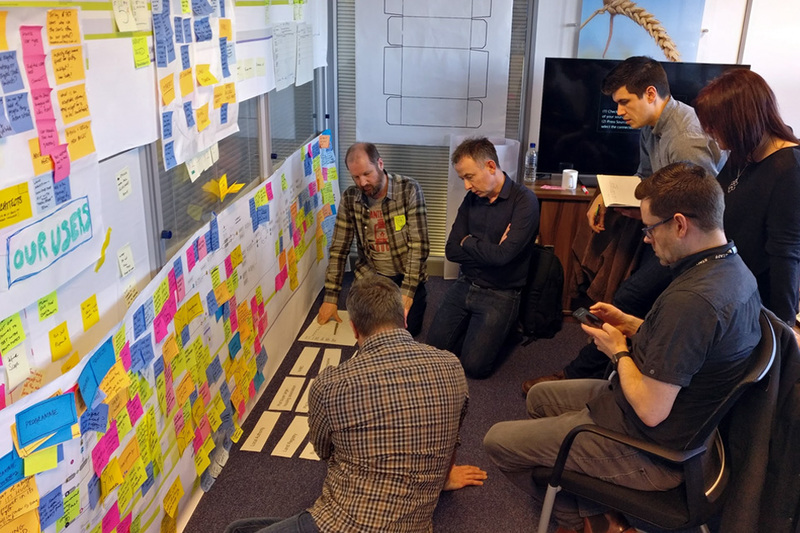 A team working within HMLR’s Digital Programme has been taking a closer look at land registration for new housing developments, and as part of that work has created a set of digital service mockups as a tool for doing user research. We have shown the mockups to users to see what they thought of them. They are not necessarily services we will actually build - they’re just a way of showing our thinking visually. To begin with, the developers of a new estate need to be sure that the land they're building on is the right land, and that the boundaries they see in the real world match up with the boundaries recorded on the relevant deeds. They need to be sure that the land they want to build on is the land they're entitled to build on. In most cases, a large piece of land being developed needs to be divided up into smaller plots, which become new properties for sale. When the newly-built homes go up for sale with an estate agent, everyone involved - the developer, the estate agent, potential buyers, conveyancers, mortgage lenders and so on - needs to be sure that the plot someone is buying is the right one, and that all the relevant information about that plot on the register is accurate. It's a surprisingly complicated process. What makes it more complicated is that it's not really a "process" at all, at least not one that's been designed to work the way it does. It's actually a series of processes that have grown over many years, aggregating one on top of another. No-one has ever stepped back to look at the whole service journey and think about how it all works. So, recently, as part of the HMLR Digital Programme, we've been doing some work to better understand all this complexity, and find ways to make it simpler. Some people would argue that there's nothing actually wrong with it. After all, most of the time, it works: developers acquire land, divide it into plots, build houses, and successfully sell them, every week. But a working process isn't the same as an efficient process. And we believe there’s plenty of scope for making this one more efficient. In discovery, our research showed that many paths through the process share the same problems, particularly with lack of transparency. Data exists, and most of it is very simple, uncontroversial data. It’s just hard to get hold of, even by people (such as conveyancers and HMLR caseworkers) who need it to do their jobs. In most cases, the lack of sharing isn’t because anyone is unwilling to share. It’s because sharing is difficult. The data usually exists on paper, in one place. Sharing it usually means a lot of time-consuming photocopying and posting things. The result of this lack of transparency is delay. Things that could have been checked and assured earlier in the process end up creating errors and questions later on. Our hypothesis on starting our alpha was that if we could find ways to make simple information more visible to more parties, the whole process could be made smoother, faster and more efficient. We could cut down those delays. Another concept we’ve been thinking about is “readiness”. Before a newly built house can be actually sold to a buyer, everyone has to reach a point where they are ready to sell: the vendor, their conveyancer, the buyer, their conveyancer, and the mortgage lender. The way things are done now, none of those parties knows for sure when any of the others expect to be ready or are ready. This is solved by lots of letters and phone calls. Again, we had a hypothesis: what could happen if this state of readiness was more visible to more people, earlier on in the process? And how much would it help if HMLR could also let everybody know that everything we need for registration was also ready? But again, transparency is an issue. We don’t share the EPA with anyone other than the developer who submits it to us, so sometimes the buyer only finds out their plan doesn’t agree after the sale has completed and we receive an application for registration. As part of our alpha work, we wondered if we could open up the known information about plots and estates. Our hypothesis is that if this information was more easily available to more people, the registration process would be much simpler for everyone concerned (including HMLR). As I said at the start, these mockups show are a useful way of thinking visually. They help us demonstrate what might be possible. Just to reiterate: we’re not proposing to turn these mockups into actual services, not as they stand. We’re all too aware that the reality of registration is much more complicated than we’re showing here, and that there’s a great deal more user research to do. But these mockups are good to show what greater transparency might look like, and how the parties involved in selling new developments might have a better understanding of who is “ready” to complete. If you could see a web page with such-and-such information on it, how would that change things? It’s unbelievable how many versions of ‘the same’ plan exist, and the large number of opportunities for different versions to exist, every party believing they have the right one. A single source of truth makes sense. When we said the digital programme would be putting users first, this is exactly what we meant. 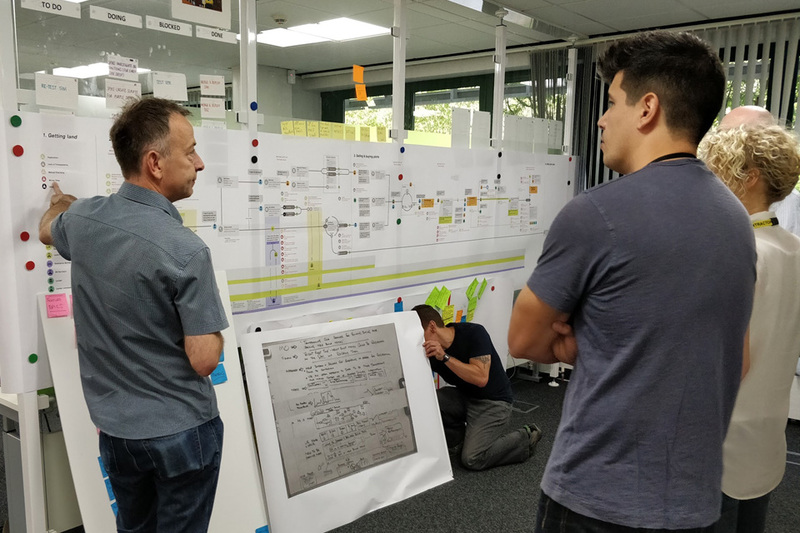 We have been working on a transformational data visualisation methodology at the NHS Hack Day in Birmingham today, which uses stacked timelines and icons to display entire documentary records on any subject of interest in a highly intuitive manner. It is based upon a unique and powerful visualisation overview tool for clinical records which is now live at University Hospital Southampton, and which finds global applications in the transformation of complex data sets for easy comprehension. Happy for you to get in touch and to learn more about the possible relevance to your own work. We believe that this may have practical utility in advancing your own data challenge. That sounds very interesting! There's so much opportunity to help users with good visualisations, I'm always drawing pictures to try and get ideas and concepts across. Generally agree but why have plot numbers? Searches against plot numbers and answers against postal numbers (or vice versa) is, I believe. a significant cause of claims against local councils. Some thirty years ago I acted for ta council on the sales of 100 houses for a local council and insisted on a numbering and naming scheme being in place upfront. The plot vs address thing has come out strongly in our research. I know it causes problems inside HM Land Registry when we're trying to be certain if something about house no. 72 is affected by, say, something we have against plot 40. John - I'd be very interested in understanding a little more about the claims against local authorities problem you mention. 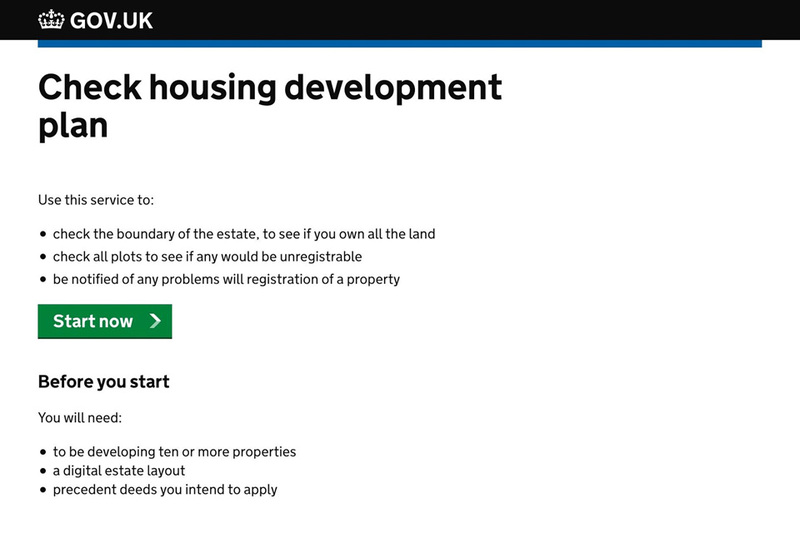 Please get in touch via ian.howe@landregistry.gov.uk if you'r ehappy to share more details. Hi Ian, I came to one of your stakeholder days last year when the plot v postal address topic came up, and suggested we think a bit differently. We all have GPS on our phones now, and there are tools such as what3words which are more user-friendly. If we want to be accurate about a piece of land, then I don't think the problem is solved by either plot numbers or postal addresses. A few months ago attended a lecture at the ODI where an employee from Birmingham Council described how that authority was sharing traffic management data internally. I commented that highway development data should be shared similarly and with HMLR. Something similar could also be used for other infrastructure projects. EG fibre cabling. Housing estate improvement schemes can produce a multitude of small land transfers. Particularly where only some properties have been sold off under the right-to-buy. Yesterday's good ideas (laundry rooms, recessed doorways, janitors cupboards etc) can become ASBO venues and need changing from common parts to additions to flats. Angling fences to eliminate mugger-friendly sharp turns in rear accesses can create incredible problems. On new flats plans need to extend to all levels to avoid issues of trespass when an architect decides to add Juliet balconies without reviewing boundaries or telling others. You make interesting points about the various parts of Government being more joined up and that's on our radar for the future. Our current thinking is that pages about estates and the plots on those estates could exist (and persist) on GOV.UK and that ultimately those pages might include related information from other parts of Government. But at this stage these are all hypothesises we'll want to test further and I'm keen we start with a smaller, defined publication (just because it'll be easier to get off the ground) and then grow that offering wider if it seems to be of value. We also have in mind that we should be thinking about also offering the things we publish through web services so that other parts of UK Plc can offer services and innovations in and around new build estates. I'd welcome the inclusion of SNN as a step in the proposed single process as it would help consistency, but I wonder have GeoPlace been involved in discussions? We talked to a few local authority street naming departments during one of our early research exercises. My understanding is that the association between plot and address is not always present in the data that gets passed to GeoPlace by local authorities so we weren't sure if it would prove a reliable source for all estates... but it's something we'll re-visit for sure. As I've mentioned above, I've a preference for letting people use whatever description is best for them rather than try and enforce a standard. I am a street naming & numbering officer and at the local authority I work for we work with very detailed plans when it comes to large developments and that we can map the exact boundary of a property to its issued address even if it is on the eleventh floor. We draw this as a polygon so we know that Plot D2-201 is flat 103, Smith Point, 10 Smith Street, London SE13 5QS. All our addresses are issued against the developers Plot number so I think that if LR were to work with us and register the address and draw its boundary (we would be happy to supply geo-referenced files) that would mean that addresses are used as early as possible in the process. Rather than one property being known in several ways. We already have this as an in-house process so that any new development being built is addressed months ahead and will begin to refer to the address issued by us rather than a plot number. This will force more developers to start using the addresses rather than continue to refer to the property as their isolated point of reference. Hi Fathima, that sounds really interesting... could we discuss further? Do you know how common the way you work is around other local authorities? Estate layout plan approval already exists, but I do not understand why there has to be a minimum number of plots before this service is available. A two unit site potentially has the same issues as a 100 unit site in respect of external boundaries (ie those with neighbouring titles). I'm convinced that one of the primary drivers for HMLR setting a minimum number of plots for estate plan approval is the fact that the process is currently entirely manual. We'll be looking at ways to try and speed up some of the checking (or maybe even remove some checks if they don't add value) and I hope that would allow us to extend the service to more and more estates. It is good to see the new build process is being looked at. I would like to see a compulsory requirement for an estate layout plan to be approved on all new build developments, even small ones. Also there should be a clearing out from a developer's title of old redundant rights and covenants before plots are sold. Also the seller should amalgamate titles more often. We have a development of flats where single flats in a building derive their lease from three different titles. I have to confess I have a bit of a bias against mandation... I sort of want to deliver products so helpful that people choose to use them. But I totally get where you're coming from - we know from our research that buyers' conveyancers really value approved layouts and are disappointed when they don't exist. There'll be a number of reasons why plans don't get approved for some estates but I think sometimes HM Land Registry could do more to sell the benefits. There's also a separate initiative going on within HMLR to work more closely with the big property developers to try and get their titles in a better state for the plot sales... I'll see if they're including amalgamations in that work and forward your comments to them. Making the basic details of an approved estate layout plan available via the existing map search tool would be useful and surely not too difficult to implement. If buyer's conveyancers know what has been approved they can obtain full details from the developer. I like the way you think Joshua! If you accelerated the LLPG processing you could bind the plot to the uprn, which would simplify things somewhat as it would inherit the address once assigned by Royal Mail? Thanks for this Tom, it's one of the many things we've thought about... we'll dig into the idea again when we start to focus on the plot / address issue. This is a great start, we would ideally like to see a notional register created from the approved estate layout plan at HMLR so that at the point at which the plan is determined buyers, and sellers, know what will benefit and burden the property and to simplify the conveyancing process. The idea of a "notional" register has been kicked around for a while. In our current thinking I'm seeing it more as a preview of how the new register would look... but essentially I think it's meeting the same needs. In my opinion some of the previous thinking around "notional" ran the risk of us doing all the work to prepare a new register before the information became truly finalised and stable. That's one of the reasons we think we should look at plans first - finding the "sweet spot" when the plan is "right" and not just what is proposed to be built could be really helpful for everyone. What would be really interesting would be to hear what other bits of information our customers wish they knew earlier... is it the address... the title number... the way the new register will look? Could it be possible to create an OS2 with an open priority expiring either on application for registration or cancellation by the applicant? I'm hoping to run some workshops about the subject later in the year - it'd be great to get the conveyancing community involved... I'll drop you an email Beth. In the meantime, anyone else with views on OS2s, please share! Thanks for sharing that insight into the problems you can have when you need to submit multiple OS2s. Street naming and Numbering and Local Authority involvement in this is a must given they issue the planning permission and are the only official authority for naming and numbering of properties. The rest flows through the LLPG and conversely the National Address Gazetteer. Improvements to how and the point at which Land Registry take the official addresses (and from whom) is perhaps the key consideration. It would be great to get local authorities involved! Most (probably all) LAs inform us of new street naming but the process does feel very much like it did when they used to send us a letter. Planning permission is another really important milestone moment in the process of building new homes and currently HM Land Registry seem to have very little visibility of this. One hypothesis we've played with is that we shouldn't approve estate plans until planning permission has been granted... what do people think? And is there a simple way to find out when a site has been granted permission in England and Wales? We have a lot of thoughts and questions in and around the plans and addresses. I'm keen that we try and find ways to quickly improve things within the the existing frameworks but at the same time, we want to be asking some more fundamental questions about when things should or shouldn't happen. As an example, at the moment we still seem to think in a "whole estate" plan way which I think is a legacy from when there were just large paper plans. I wonder if individual plots could be approved as they approach the completion of the build... are multiple changes of plans before that "final" version really helping people? Some very interesting comments here. The developer we work with most has plot and postal addresses on its paperwork from day one. Plans are an ongoing issue and often need tweaking during the registration process which causes long delays particularly when one has an awkward client who thinks he is going to end up with less than he thought! Why can't HMLR approve all plans and TP1s before the conveyancing process starts. I am not suggesting land registry assists the developers legal team in drafting those documents but checks them to make sure what is being granted or reserved in particular is actually accurate. I have an example at the moment where parking spaces have been included in the red edging but they actually fall within the managed areas of the estate. This is something which is clearly human error but is causing awful problems post completion. I also agree with Andrew G's comments that Land Registry needs to be given powers to remove historic information. We need to accept and agree that historic rights of drainage for example really carry no weight once the land has been developed. My final comments concern restrictions which get left on the title but clearly were not meant to burden an individual plot. Can land registry not have a process where these are automatically removed from plots without the need for an RX form. Thanks Helen, I completely agree, finding problems post completion (ie when HMLR are processing the registration application) is too late. We really want to try and help customers get things right before completion - then registration should be a formality. Developing estates seem like the best place to start thinking like that because there's a period of time when the properties are being built when everyone knows a plot sale is coming. I think the services we currently offer in this space (Estate Plan Approval, Draft for Approval etc.) were intended to help with this but we're still seeing a lot of problems post completion so it feels like time to look at them again. What sort of things would buyers like to see up-front to help get things right at completion? Thanks for your reply. I still feel that the plans and documents need to be correct and approved by land registry before any plot is sold or exchanged. This means getting the developers on board long before the properties are constructed. It will be difficult because the developers are sales driven but we can't keep having post completion problems particularly when developers legal teams don't always seem to want to help. What's proven interesting in our work so far is how there seems to be more scope for the plan to change quite close to completion (and therefore after exchange?) - often it's when the fencing goes up that someone spots that something hasn't quite followed the plan. I manage a small team of conveyancers dealing with the plot sales conveyancing for housebuilders and retirement village developers. We always seek Estate Layout Plan Approval on every development - as early as possible in the process and give the ELPA details to the buyer's solicitor. It is an incredibly helpful service. I wouldn't advise HMLR to get involved with checking for planning permission because (a) its very complicated/time consuming to check for anything other than outline permission - and that alone isn't the complete picture, and (b) its beyond HMLR's remit? Developers use plot numbers because they will have been working with their architects/other professionals for months/years ahead of postal addresses being issued and they need to be able to identify each property by some kind of reference. Once established, the last thing they want to do is to at some point change to the postal address because it will cause confusion and difficulty. Many may not have sympathy (!) but remember it is very difficult to develop houses in today's highly regulated environment and there is much pressure on developer's to increase their output. Therfore, I like Ian's comment that he wants to develop services so useful that conveyancers will want to use them, rather than increasing the regulatory burden. I notice you said you worked on plot sales on retirement villages sometimes... we were interested in reaching out to developers working in those market sectors as we wanted to think about how we could make our services as accessible as possible for all users. Would you perhaps be able to drop me an email at ian.howe@landregistry.gov.uk to discuss? Some exciting ideas here and I particularly like the concept of a notional register - it would save so much time to know in advance which entries on the parent title will actually pass to the new title. Worth remembering that not all new build sales are individual plots sales - social housing is often sold as a block and this can cause problems if the developer has obtained the wrong type of plan approval. 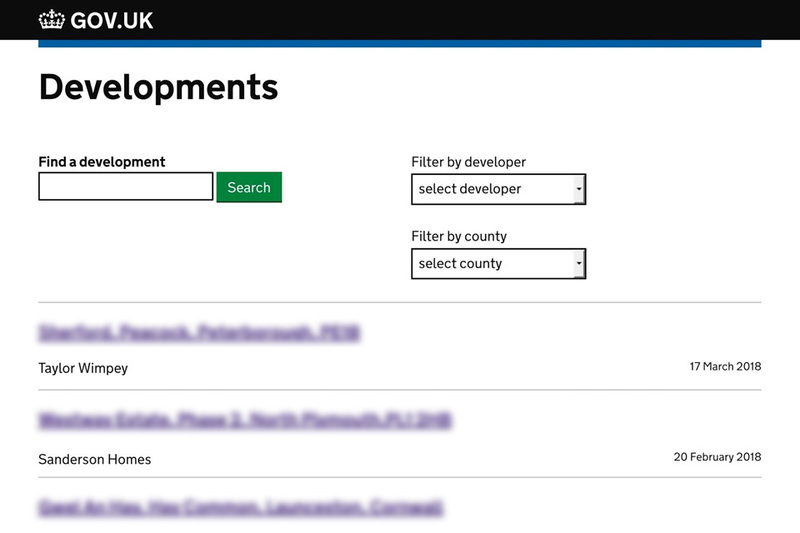 Mapsearch has been a fantastic innovation by the Land Registry so hoping for great things on new build as well! This is an interesting concept that would help the utilities contracting company, I work for, complete new connections and get paid quicker. As it stands we are waiting months, if not years, for new addresses to be registered on Royal Mail or VOA. If I understand this blog correctly that is. I did quite a bit of work tracking mortgage lender exposure to individual new build developments. There is quite a bit of scope for fraud at that level as plot numbers on properties can be switched round to mislead mortgage valuers. When house builders give a postcode for a new build site they will give the postcode of e.g. a nearby rugby club or wholesale carpet warehouse (to get people to a geo live location), which means that linking postal addresses to site addresses is very problematic. Even more so when the site name is at the whim of the developer and the Local Authority decide the street names. In some cases a development might also have two names, one for private sales and another one for social housing shared ownership sales. We're very interested in the problems lenders have in and around new builds. Our casework staff have noticed that when we receive applications containing conflicting descriptions of the property addressses, the one shown on the mortgage is more often than not, the correct one. This is a fascinating thread, I had no idea that things were so complex (though, given what I've about to say, perhaps I should!) My husband and I agreed last spring to buy a self build plot on a small estate replacing a former residential community for people with learning difficulties. We completed on the plot before Christmas and our foundations were poured this week. I happened to see the developer on site yesterday and he calmly informed me that, as some of the other plots on the site have been amalgamated and another big one has been split into 2, he's 'going to remember the plots to remove any missing numbers'. This would mean that the address of our legally owned plot, on which the address has been registered (using the plot number) and is being used (we have a lockable postbox on a tree on the plot) would change. Is it legal for him to do this? Sorry, 're-number' not 'remember' the plots. Stupid computer trying to be clever..